This amazing Mountain pines stencil kit helps you to easily create a beautiful forest mural using simple painting techniques. Kit contains 5 various pine trees, which can be randomly placed on a wall and stenciled repeatedly for desired "forest" effect. Select 3-4 shades of paint of different values, from dark to light. We love greys, beiges and subtle greens for this project. Or, choose three shades of grey. Place smaller and lighter trees toward the top of the wall, and largest and darkest trees closer to the bottom of the wall as if they are on the foreground. For a "misty" effect, stencil only the tops of the trees fully and barely shade the bottom parts of the trees, as if they are hidden in a mountain mist. Please make sure you watch our short step-by-step Video Tutorials! You'll find them extremely helpful for your stenciling project. Even beginners get great results! 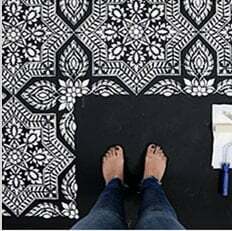 You can stencil with acrylic or latex paint, stencil creams, fabric paint or glaze. Use a foam roller or stencil brush. Although our stencils do not require the use of spray adhesive, this step can help minimize paint seepage, especially if your walls have a slight texture to them. (Elmer's spray adhesive seems to be the best). Make sure you shake the can well and lightly mist (not drench) the stencil, and let it dry for a moment before positioning it on the wall. This step will prevent the adhesive residue transferring to the wall. You'll need to re-mist the stencil after a few repeats. Note: you will still need to hold the stencil in place with a few pieces of blue painters tape! Adhesive by itself is not enough to hold the stencil on the wall. Clean-up tip: Spray the stencil with Simple Green to help to remove adhesive residue. Please note that once you've used spray adhesive on your stencil, it will never really come off completely. That is why we personally prefer not to use adhesive, and instead use less paint on your roller or stencil brush. Our professional decorative painting company, SpecFin Designs, has been a leader in decorative and faux painting for over 20 years in NYC/NJ Metropolitan area. After many years of painting we decided to open a stencil company and start selling stencils to other artists and craftsmen. When you buy stencils from Cutting Edge Stencils you're buying stencils expertly designed by the painting pros! Our stencils are of superior quality and they really work. You can see many beautiful examples of our stenciled projects by visiting http://www.specfindesigns.com.